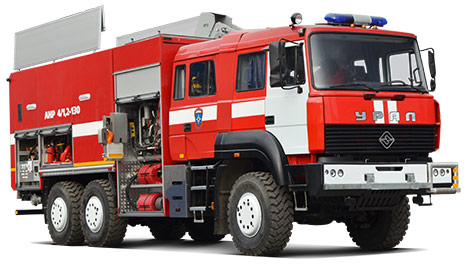 New product is a unique fire-fighting vehicle ANR 4/1,2-130 on the chassis Ural-6370. delivery of fire-fighting crew to the place of emergency situation, for fire extinguishing and implementation of accident rescue operations with the help of fire extinguishing agent supply, for delivery of fire-fighting equipment and life-saving instruments as well as for supply of fire extinguishing agents to the site of the fire from other sources. for placing near the water source and carrying out the functions of pumping station, providing water supply, including seawater with the suction height 25 meters and possible distance from ANR up to 30 meters. Implementation of water withdrawal from water sources, not only from equipped (adapted), but also from unequipped (unadapted) places for these purposes, including abrupt and waterlogged shores, bridges, piers, waterfront structures etc. for water pumping in case of natural or anthropogenic emergency situation. for pumping-over of fire extinguishing agents, including seawater, and efficient, simultaneous filling of several tanks, located at the big distance from the ANR. for mechanized unwinding and rewinding of the hose lines.